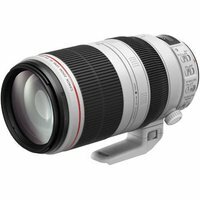 The Canon EF 100-400mm f/4.5-5.6 L IS Mark II USM lens builds upon the success of the popular MK I. A redesigned optical system for superb sharpness, 3-mode Image Stabiliser, and an improved minimum focusing distance of 1m. This solid, super-telephoto lens with rotating zoom design is ideal for a wide range of applications, including sport, portraiture, wildlife, pet and travel photography.